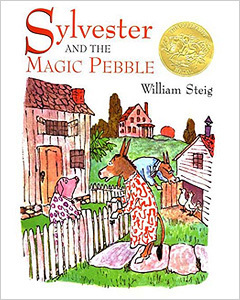 Sylvester and the Magic Pebble by William Steig is not only a Caldecott Award winner. It’s a classic. Sylvester the donkey, who happens to enjoy collecting pebbles, makes an incredible discovery. He finds a magic pebble that makes wishes come true! On his way home to share the magic pebble with his family, Sylvester encounters a hungry lion. When he wishes himself out of danger something goes terribly wrong. After a great deal of time (and strife) isolated from the people he loves, Sylvester finally reunites with his family. To everyone’s relief, the story ends on a happy note. Sylvester realizes he already has everything he needs. We don’t usually use the words sorrow and children’s book in the same sentence. However, Steig manages to use topics like grief, isolation and loneliness to his advantage. Without the devastating separation from his family, Sylvester might never have developed such a profound appreciation for them. In the end Sylvester realized he had no need for magic wishes. His family had each other, and that was plenty to be thankful for. As far as children’s picture books go, Sylvester and the Magic Pebble is a long one. It appeals to kids from age 5 all the way to grade 5. It’s a great tool to open up any number of discussion topics. Family, separation, grief and sorrow, magic and wishes, being careful what you wish for, you name it. And let’s not forget some of my favorite topics, gratitude and giving thanks. Want to see Sylvester and the Magic Pebble on video? Check it out here. By the way, if YOU had a magic pebble, what would you wish for? What’s that you say? You wish to find an entire collection of Inspiring Children’s Book Finds like this one? Well okay then. Wish granted!